[Episcopal News Service – Linthicum Heights, Maryland] The Episcopal Church’s roadmap of the Jesus Movement has been guiding Episcopalians in their response to the chain of disasters that have struck the world in the last two months. 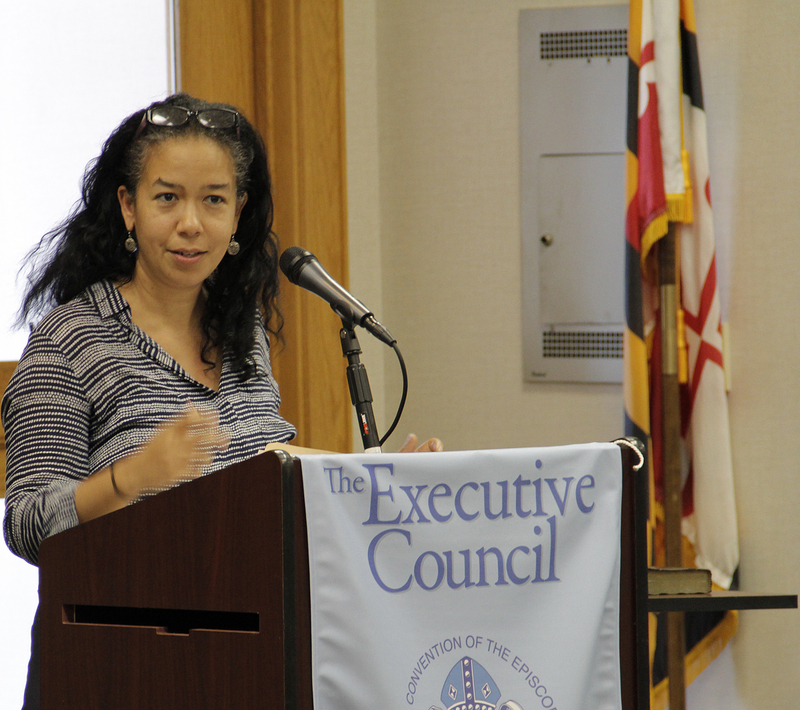 “You can see it in that we have various departments of the presiding bishop’s staff, the companion dioceses, Church Insurance, ourselves [at Episcopal Relief & Development], diaspora Episcopalians, friends and good people of faith all working together,” Abagail Nelson, Episcopal Relief & Development senior vice president of programs, told the Executive Council Oct. 19. Nelson gave council members an overview of the kinds of work Episcopal Relief & Development is supporting by way of what she called “this great chain of strength and assets” that is enabling Episcopalians to “do much more than we can do alone.” That work includes such efforts as setting up online tools for affected Episcopalians to communicate with each other and keep track of work done and help needed. The organization is also supporting such efforts helping to supply water, tarps, solar batteries, pastoral care, and connecting with other relief and government agencies. and wildfires in Northern California that erupted the night of Oct. 8 and are still raging. Nelson urged patience as more and more Episcopalians want to come to hard-hit areas and lend a hand. Those areas will be ready to receive volunteers at various times, based on the situation on the ground. “No one is quite up to it yet,” she said. Right now, there is a major need for pilots and planes able to fly into areas where air traffic control systems are not functioning. “We’re looking for clear, leverage-able ways to get supplies into islands that we can trust,” she said. Nelson also urged Episcopalians to keep their wicks trimmed and their go-bags ready. “I’m really serious,” she said. “We don’t know what’s going to happen next year or tomorrow or with winter storms or whatever. So, think of ourselves and your family, your church, your diocese – how you will stay in touch with each other, how you [could] be [living] by yourself for at least two weeks. Council member the Rev. Jabriel Ballentine tearfully described how Nelson and other Episcopal Relief & Development staff members supported him after Hurricane Irma as he tried to learn the fate of his parents who live in Charlotte Amalie on St. Thomas in the U.S. Virgin Islands, where he was born. “It was three days, I didn’t know if my parents were alive,” he said, but people from Episcopal Relief & Development kept him company during that time. Ballentine’s mother, Rosalie, is a member of the group’s board and is also the Episcopal Church’s lay member of the Anglican Consultative Council. Floberg walked to the middle of council’s meeting room, bent down and put money on the floor in front of the podium where Nelson was speaking. His colleagues applauded and followed his example as Nelson continued to answer questions. Council’s Oct. 18-21 meeting is taking place at the Maritime Institute Conference Center. Committee meetings will take up most of Oct. 20 and, on Oct. 21, the committees will each report to the full body, proposing resolutions for the full body to consider. “…they put the money down at the feet of the dancer…” –several years ago the Northern Choral Society in Watertown, NY, of which I was a part, appeared in concert with a chorus from Malawi. It concluded when our guests began a chant which went on at length as people realized they were expected to bring donations up front and drop them at the feet of the singers. How fascinating that a similar custom is practised by the people of the Sioux Nation. The world is so small! Hey Mary frances! Thank you for this article. Thank you for keeping us in the conversation. I’d like folk to remember though, Hurricane Irma devastated the Virgin Islands too. Not just Maria. If you’re able, would you note that in your article?